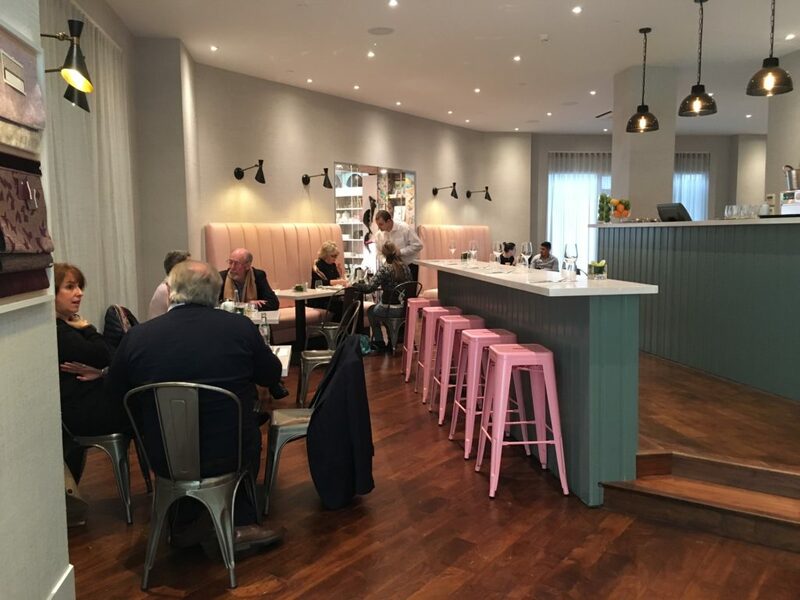 At the Design Cafe diners can enjoy an informal all-day brasserie menu from Absolute Taste surrounded by beautiful designs from the showrooms. As well as light lunches and delicious meals the Design Cafe also serves freshly made cakes and muffins. The bar is a perfect spot to have a coffee, and everything is served by professional friendly staff. With the Bookshop adjoining the Cafe it is also possible for customers to peruse some of the fantastic specialist interior design books and magazines on offer. The convivial space, curated by stylist supremo Arabella McNie, is a triumph of relaxed chic in a soft palette of pink, olive and smoky grey. It features banquettes upholstered in ‘Annecy’ leather in from Whistler Leather, wallcovering in ‘Provincial Weave’ by Thibaut at Jacaranda Carpets and ‘Shiro’ sheers by Mark Alexander at Romo. New paint includes ‘Vineyard 65’ by Sanderson and ‘Architects White’ and ‘Quarter Quartz Grey’ by Zoffany, all from Style Library. Adding a final flourish are contemporary ‘Glass York’ pendants from Original BTC, ‘Bacco’ wall lights and a ‘Daphne’ table lamp from Julian Chichester, alongside a statement ‘Gemstone Mirror’ by Alexander Lamont from The Bookshop and artwork from Paolo Moschino at Nicholas Haslam Ltd.